A man counts Venezuelan bolivar notes in downtown Caracas, Venezuela, Jan. 9, 2018. Venezuela's opposition-run parliament on Tuesday outlawed a "petro" cryptocurrency promoted by socialist President Nicolas Maduro, calling it an effort to illegally mortgage the cash-strapped country's oil reserves. Maduro on Friday said his government would issue nearly $6 billion of petros as a way to raise hard currency and to evade financial sanctions imposed by Washington. Cryptocurrency experts say Venezuela's mismanagement of its own economy, combined with the ruling Socialist Party's historic lack of respect for private property rights, will likely leave investors uninterested in acquiring petros. "This is not a cryptocurrency, this is a forward sale of Venezuelan oil," said legislator Jorge Millan. "It is tailor-made for corruption." 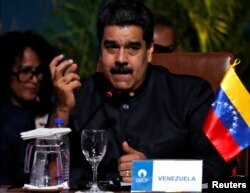 Legislators warned investors that the petro would be seen as null and void once Maduro, who is up for re-election this year, is no longer in office. They added that the petro issue violates constitutional requirements that the legislature approve borrowing. FILE - Venezuela's President Nicolas Maduro speaks at the IV Gas Exporting Countries Forum in Santa Cruz, Bolivia, Nov. 24, 2017. Maduro has routinely ignored the legislature since his party lost control of it in 2016, and the pro-government Supreme Court has shot down nearly every measure passed since then. In July, the country elected an all-powerful legislative body called the Constituent Assembly, a vote that was boycotted by the opposition. The government of U.S. President Donald Trump described the new Constituent Assembly as the consolidation of a dictatorship, and issued sanctions barring U.S. financial institutions from acquiring any debt issued by Venezuela after mid-2017. That has effectively blocked Maduro's government from refinancing its hefty debt burden, and would likely add to investor concern about the petro, although it was not specifically mentioned in the sanctions measure. Maduro hopes it will serve as a payment mechanism for foreign suppliers and avoid the payments delays that have grown more acute since the sanctions went into place. The government plans in the coming weeks to issue 100 million petros, backed by 100 million barrels of oil reserves. The petro's price is initially to be pegged to the value of Venezuela's basket of oil and fuel exports, which last week closed at $59.07.